With additional reporting by Matthew Charles Cardinale. (APN) ATLANTA — The State House is currently considering SB 403, to replace the current E-voting machines, which are direct recording, with ballot marking devices, allowing for a paper audit trail in Georgia elections by Jan. 01, 2024. On Feb. 28, 2018, the bill passed the State Senate nearly unanimously, in a vote of fifty to one. However, elections integrity organizations including VoterGA, Common Cause Georgia, Verified Voting, the National Election Defense Coalition, Georgians for Verified Voting, and the Georgia Sunshine Project have expressed their opposition to the House version of SB 403 in part because voter protections were ignored. “It would permit a software created barcode to constitute the official ballot rather than the human readable text printed on the ballot,” Marian Schneider, President of Verified Voting, an organization funded by computer scientists, testified to the House Governmental Affairs subcommittee on Wednesday, March 14, 2018. “I point this out because a barcode is insecure because it is generated by software. A software-created process can be altered by software. Those software generated items should not control in case of discrepancy,” Schneider said. The language in the bill is ambiguous in places and falls short of the goal they are trying to achieve for Georgia voters and does not give clear guidance to local election officials in case of a recount, according to computer experts. In fact, in one place the House bill gives election officials the discretion, in case of a recount, to scan the barcode votes again for tabulation which, of course, may give the same possibly flawed result. Voter integrity advocates want language in the bill that makes it clear that a recount is hand tallied from the official paper ballots which the voter has verified to contain their correct vote. “The objection centers around a barcode that has votes in it that the voter cannot verify and those are the votes that are used for tabulation. Nearly every expert in the U.S. opposes that,” Garland Favorito, co-founder of VoterGA, said. “The incumbent vendor Election Systems & Software (ES&S) uses bar coded votes in their latest ballot marking devices and that seems to be why the House does not want to outlaw them,” Favorito told APN. In 2001, Georgia had a law that every voting machine had to have an independent audit trail of each vote cast, but the legislators removed that law and opened the door for former Secretary of State (SOS), Cathy Cox, to purchase the 54 million dollar Diebold voting system that had no independent audit trails. “We believe that has disenfranchised us for the last fifteen years,” Favorito said. “We are moving too fast for something this substantial to our voting process to move forward. It looks like we are doing something, but we may not be,” Rep. Howard Mosby (D-Atlanta) told APN. He voted against the House bill in the House Governmental Affairs sub-committee. The new timeline is another problem because it allows the current SOS, Brian Kemp, to pick the vendor, which will probably be the incumbent vendor ES&S used in the Rockdale County pilot program covered by APN. The ES&S system could cost Georgia taxpayers over 100 million dollars or even 200 million dollars, when more transparent, cheaper, and better systems are available. “The vendors are trying to get us to buy expensive ballot marking devices as a substitute for pencils and pens to mark paper ballots,” John Fortuin, Founder, Defenders of Democracy, testified. The bill passed the full House Governmental Affairs committee. Committee Chair State Rep. Ed Rynders (R-Albany) would not allow a hand vote, only a voice vote, so it is impossible to know how many voted for the bill and who voted against the bill. If this bill passes Rules Committee and then the General Assembly, without the loopholes closed, then Georgia could be replacing the DRE equipment that has been hacked and is unverifiable, with new barcode technology that is unverifiable and can also be hacked. 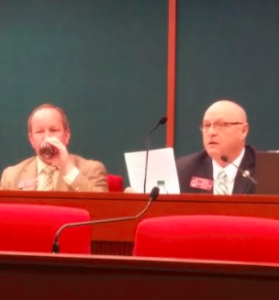 After the meeting, APN asked Rep. Ed Setzler (R-Acworth), sponsor of the House version and supporter of barcodes, if he believed barcodes could be hacked. “I believe virtually any computer system can be hacked,” Setzler replied. At a later press conference, Favorito and Sara Henderson, Executive Director of Common Cause Georgia, spoke about reasons the controversial House bill should be tabled. “For a Gubernatorial candidate [Kemp] to have that kind of power… it opens up a Pandora’s box to receive campaign contributions from these vendors and locks the incoming SOS to a contract he or she may not agree with,” Henderson explained. “This is a very partisan piece of legislation, where Republicans… have almost complete control over the process. This is DRE 2.0 and we are not getting anything out of this bill that protects the Georgia voters,” Henderson said. The State Senate was working with elections integrity groups, but when it got to the House, “they hijacked the bill and ignored all our requests. It concerned us that it had the fingerprints of a hardwired deal for the incumbent vendor,” Favorito said. “It’s very difficult to compete with the vendors who are spending a lot of money to get this hardwired into the law. This has not been a transparent process,” Henderson said. UPDATE 1 and CORRECTION: A previous version of this article stated that the Coalition for Good Government has taken a position on the E-voting bill in the Georgia House; however, according to Marilyn Marks, Executive Director of the organization, it has not taken a position. The article has been updated to reflect this. There was a recent lie about Hispanics and voter registration. Fox News reported that in Pennsylvania it was discovered that 100,000 undocumented aliens had registered to vote. This is false and would mean 1,000’s of illegal voters in each county! Great article by a GREAT JOURNALIST. Thanks Gloria for summarizing the entire Election Integrity Battle in Georgia by one sentence: If this bill passes Rules Committee and then the General Assembly, without the loopholes closed, then Georgia could be replacing the DRE equipment that has been hacked and is unverifiable, with new barcode technology that is unverifiable and can also be hacked. BRILLIANT. FYI, my national Election Integrity Organization also lobbying heaving this week and we told legislators, pass SB403 and there will be lawsuits. !